Velocity by Alan Jacobson, a Mysterious Review. 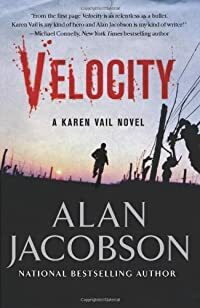 Review: FBI Special Agent Karen Vail is in a desperate search for her partner (in love and in fighting crime) after her actions in securing the arrest of a serial killer may have actually caused homicide detective Roberto "Robby" Hernandez's disappearance in Velocity, the third mystery in this series by Alan Jacobson. Vail uses her not inconsiderable talent and influence to tap whatever resources are available to find Robby. But Vail's brute-force methods aren't always welcome, and despite the stated goal that his recovery and return is a top priority, jurisdictional boundaries and issues tend to get in the way. When she's ordered to return from Napa Valley to Washington DC to participate in another case, she continues to be involved in the search for Robby, if only by proxy, through a covert government operative, who seems to be able to tap into the secrets of the most obscure individuals — secrets some will do anything to keep from being exposed. There are two other issues — not problems, exactly — that should be noted. First, Velocity apparently picks up moments after the previous book in the series, Crush, ends. Readers new to this series will likely be completely lost at first — and maybe lost throughout — especially since the action begins almost immediately in the second chapter with little backstory. (The first chapter about an apparently at-large killer seems, contextually, out of place and oddly superfluous.) Second, and this may be related to the first, all this activity tends to mask what is really a thin plot; little of substance or consequence happens along the way. Despite being a nonstop thrill ride, Velocity doesn't seem able to stand on its own, story-wise. Acknowledgment: Over the River Public Relations provided an ARC of Velocity for this review.